(Newser) – Customs and Border Protection is calling out an unlikely person for crossing the nation's southern border illegally: New York City Mayor Bill de Blasio. De Blasio and his security detail, run by the NYPD, violated both Mexican and US immigration laws by crossing the border on foot during a visit near El Paso, Texas, the agency alleges in a letter obtained by the AP. The mayor's office flatly denied the allegation. De Blasio, a fierce critic of the Trump administration's immigration policies, went to the Texas border with about 20 other mayors from around the country on June 21, the day after President Trump signed an order stopping family separations at the border. 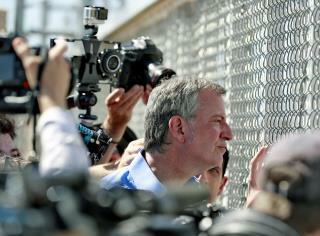 De Blasio went to a holding facility for immigrant children but was denied entry. He then went to Mexico and crossed into the US to get a view of the facility. Turns out he is an illegal alien from Israel; he should be deported immediately. GOP wants to keep liberals out of the border detention centers. Who cares, the Mexicans do it all the time.